The Colorado River flows 1,450 mi (2,330 km) from its headwaters in the Rocky Mountains of Colorado south into Mexico, where it empties into the Gulf of California. It is a major and, in some cases, life-sustaining source of water for irrigation, drinking, and other uses by people living in the arid American southwest. Prior to the construction of major dams along its route, this river fed one of the largest desert estuaries in the world. Spread across the northernmost end of the Gulf of California, the Colorado River delta’s vast riparian, freshwater, brackish, and tidal wetlands once covered 1,930,000 acres (7,810 km²) and supported a large population of plant, bird, and marine life. Because most of the river’s flow reached the delta at that time, its freshwater, silt, and nutrients helped create and sustain a complex system of wetlands that provided feeding and nesting grounds for birds, and spawning habitat for fish and marine mammals. In contrast to the surrounding Sonoran Desert, the Colorado River delta’s abundance was striking. Today, the lower course of the river, which forms the border between Baja California and Sonora, is essentially a trickle or a dry stream due to use of the river as Imperial Valley's irrigation source. Prior to the mid twentieth century, the Colorado River Delta provided a rich estuarine marshland that is now essentially desiccated, but nonetheless remains important ecological resource. Until 1921, the section of the Colorado River from its headwaters in Rocky Mountain National Park to its confluence with the Green River in Utah was known as the "Grand River," the origin of several now orphaned names including Grand Lake, Grand Valley, Grand Junction, Grand County, Colorado, and Grand County, Utah. Early explorers identified the Gunnison River in Colorado as the headwaters of the Colorado River. The Grand River in Colorado was later identified as the headwaters of the river. Finally in 1916, E.C. LaRue, Chief Hydrologist of the United States Geological Survey, identified the Green River in Wyoming as the actual headwaters of the Colorado River. Colorado U.S. Representative Edward T. Taylor petitioned the Congressional Committee on Interstate and Foreign Commerce to rename the Grand River as the Colorado River. On July 25, 1921, the name change was made official in House Joint Resolution 460 of the 66th Congress, over the objections of representatives from Wyoming and Utah and the United States Geological Survey, which noted that the drainage basin of the Green River was more than 70 percent more extensive than that of the Grand River, although the Grand carried a slightly higher volume of water at its confluence with the Green. The Colorado River from Laughlin, Nevada. The Colorado River near Page, Arizona. 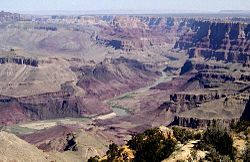 It is the opinion of some geologists that before the Gulf of California came into being some 7-8 million years ago, the Colorado River initially had its outlet somewhere along what is now the California coast. It is believed that the massive Monterey Submarine Canyon under Monterey Bay along with the associated undersea sedimentary fan may be remnants of the Colorado's ancient outlet. The Colorado River's source is La Poudre Pass Lake, located high in Rocky Mountain National Park, just west of the Continental Divide. Below Rocky Mountain National Park, the river flows through the Kawuneeche Valley and then flows through Grand Lake, the largest natural body of water in Colorado, before being dammed to create Shadow Mountain Reservoir. The river then flows into Lake Granby, another reservoir, and finally begins its journey to the Gulf of California where U.S. Highway 40 roughly parallels the river to the town of Kremmling, where it enters Gore Canyon. Most of the river's tributaries within Colorado are small. However there are exceptions, such as the Gunnison and Roaring Fork Rivers, in which massive amounts of water flow. About a hundred miles later it meets the Eagle River in the town of Dotsero, Colorado, and where I-70 parallels the river through Glenwood Canyon. The river then passes through the city of Glenwood Springs where it is joined by the swift flowing Roaring Fork River. West of Glenwood Springs, the Colorado runs through the Grand Valley and is joined by the Gunnison River in the city of Grand Junction. From there it flows westward to the Utah border and Westwater Canyon. The Colorado here ranges from 200 to 1200 feet wide (60 to 370 m) and from 6 to 30 feet in depth (2 to 9 m) with occasional deeper areas. 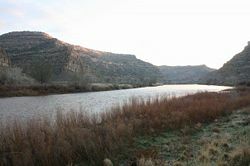 The river turns southwest near Fruita, Colorado, and is joined by the Dolores River soon after entering Utah. It partially forms the southern border of Arches National Park near Moab, Utah, and then passes by Dead Horse Point State Park and through Canyonlands National Park, where it is met by one of its primary tributaries, the Green River. The Colorado then flows into Lake Powell, formed by the Glen Canyon Dam. Below the dam, water released from the bottom of Lake Powell makes the river clear, clean, and cold. Just south of the town of Page, Arizona, the river forms the dramatic Horseshoe Bend, then at Lees Ferry is joined by another tributary, the warm, shallow, muddy Paria River, and begins its course through Marble Canyon. Here, the Colorado ranges from 300 to 2000 feet in width (90 to 610 m) and 9 to 130 feet in depth (3 to 40 m). At the southern end of Marble Canyon, the river is joined by another tributary, the Little Colorado, and the river then turns abruptly west directly across the folds and fault line of the plateau, through the Grand Canyon, which is 217 miles long (349 km) and from 4 to 20 miles wide (6 to 30 km) between the upper cliffs. The walls, 4000 to 6000 feet high (1200 to 1800 m), drop in successive escarpments of 500 to 1600 feet (150 to 490 m), banded in splendid colors toward the narrow gorge of the present river. Below the confluence of the Virgin River of Nevada the Colorado abruptly turns southward. 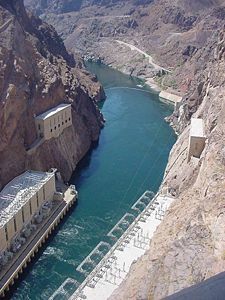 Hoover Dam, built during the Great Depression, forms Lake Mead, a popular recreation site as well as the supplier of most of the water for the city of Las Vegas. From Hoover Dam, the river flows south and forms part of the boundary between Arizona and Nevada and between Arizona and California. Along the California-Arizona reach of the river, four additional dams are operated to divert water for agricultural irrigation and for recreation. Lake Mohave, formed by Davis Dam, lies in the southern portion of the Lake Mead National Recreation Area. Lake Havasu, formed by Parker Dam, provides recreation as well as the home of the retired New London Bridge. The two remaining dams supply irrigation water: Palo Verde Diversion Dam and Imperial Dam. 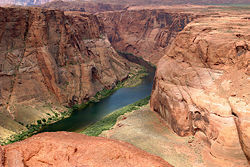 Here, the Colorado River ranges in width from 700 to 2500 feet (210 to 760 m) and from 8 to 100 feet in depth (2 to 30 m). Below the Black Canyon, the river lessens in gradient and in its lower course flows in a broad sedimentary valley's distinct estuarine plain upriver from Yuma, where it is joined by the Gila River. The channel through much of this region is bedded in a dike-like embankment lying above the floodplain over which the escaping water spills in time of flood. This dike cuts off the flow of the river to the remarkable low area in southern California known as the Salton Sink, Coachella Valley, or Imperial Valley. The Salton Sink is located below sea level; therefore, the descent from the river near Yuma is very much greater than the descent from Yuma to the gulf. The lower course of the river, which forms the border between Baja California and Sonora, is essentially a trickle or a dry stream today, due to use of the river as Imperial Valley's irrigation source. Prior to the mid twentieth century, the Colorado River Delta provided a rich estuarine marshland that is now essentially dead, but nonetheless remains important ecological resource. 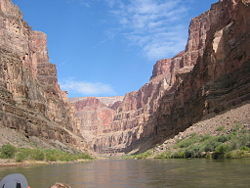 Note that the significant difference between the present height of the rim of the Grand Canyon (about 8,000 ft; 2440 m) and the levels at which the river enters or exits it gives rise to the geologic theory that its upheaval must have begun around the same time the river began flowing through it and eroding it (since rivers do not run uphill, it would have otherwise followed some other path around the upheaval). Estimates for the beginning of this erosion/upheaval process range from 5 to 70 million years ago. In the autumn of 1904, the river's waters escaped into a diversion canal a few miles below Yuma, Arizona, creating the New River and Alamo River. The rivers re-created in California a great inland sea in an area that it had frequently inundated before, for example, in 1884 and 1891, when it had for a time practically abandoned its former course through Mexican territory to the Sea of Cortez. However, it was effectively dammed in the early part of 1907, and returned to its normal course, from which, however, there was still much leakage to the Salton Sea. In July 1907, the permanent dam was completed. 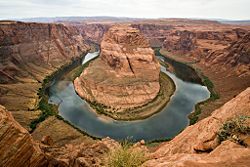 The Colorado River is a major and, in some cases, life-sustaining source of water for irrigation, drinking, and other uses by people living in the arid American southwest. 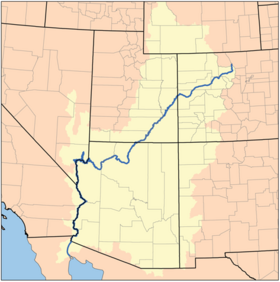 Allocation of the river's water is governed by the Colorado River Compact. 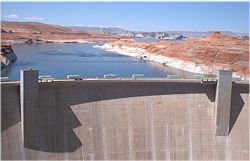 Several dams have been built along the Colorado River, beginning with Glen Canyon Dam near the Utah-Arizona border. Other dams include Hoover Dam, Parker Dam, Davis Dam, Palo Verde Diversion Dam, and Imperial Dam. Since the completion of the dams, the majority of the river in normal hydrologic years is diverted for agricultural and municipal water supply. The Colorado's last drops evaporate in the Sonoran Desert, miles before the river reaches the Gulf of California. Almost 90 percent of all water diverted from the river is for irrigation purposes. The All-American Canal is the largest irrigation canal in the world and carries a volume of water from 15,000 to 30,000 ft³/s (420 to 850 m³/s), making it larger in volume than New York's Hudson River. The canal's waters are used to irrigate the parched but fertile Imperial Valley, where several years can pass between measurable rainfalls. Hydrology transport models are used to assess management of the river's flow and water quality. Hoover Dam (originally Boulder Dam, and the first dam of its type) was completed in 1936. Its impoundment of the river in the Mojave Desert creates Lake Mead, which provides water for irrigation and the generation of hydroelectric power. Several cities, such as Los Angeles, Las Vegas, San Bernardino, San Diego, Phoenix, and Tucson have aqueducts leading back to the Colorado River. One such aqueduct is the Central Arizona Project ("CAP") canal, which was begun in the 1970s and completed in the 1990s. The canal begins at Parker Dam and runs all the way to Phoenix and then Tucson to supplement those cities' water needs. The lower Colorado is navigable by moderate to large sized craft. The lower river from Davis Dam to Yuma is navigable by large paddlewheel boats and river barges, but commercial navigation on the river is not crucial because the river is cut off from the sea, making other means of transportation more efficient in the region. Before the railroads arrived, the lower Colorado River from the Sea to near present day Laughlin, Nevada, was an important means of transportation via large steamers. Most of the rest of the river, excluding the rapids in the canyons, is navigable by small to moderate-sized river craft and power boats. Until the early twentieth century, the Colorado River ran free from its headwaters in the Rocky Mountains of Colorado south into Mexico, where it flowed into the Gulf of California. Significant quantities of nourishing silt from throughout the Colorado River Basin were carried downstream, creating the vast Colorado River Delta. Prior to the construction of major dams along its route, the Colorado River fed one of the largest desert estuaries in the world. Spread across the northernmost end of the Gulf of California, the Colorado River delta’s vast riparian, freshwater, brackish, and tidal wetlands once covered 1,930,000 acres (7,810 km²) and supported a large population of plant, bird, and marine life. Because most of the river’s flow reached the delta at that time, its freshwater, silt, and nutrients helped create and sustain a complex system of wetlands that provided feeding and nesting grounds for birds, and spawning habitat for fish and marine mammals. In contrast to the surrounding Sonoran Desert, the Colorado River delta’s abundance was striking. Early explorers reported jaguars, beavers, deer, and coyotes in addition to the abundance of waterfowl, fish, and other marine and estuary organisms. Early explorers also encountered local people known as the Cucapá, or the "people of the river." The Cucapá are descendants of the Yuman-speaking Native Americans and have inhabited the delta for nearly a thousand years. Spanish explorer Hernando de Alarcón made the first recorded contact with the Cucapá in 1540, and reported seeing many thousands. The Cucapá used the delta floodplain extensively, for harvesting Palmer’s saltgrass, a wild grain, and for cultivating maize (corn), beans, and squash. On the map the Delta was bisected by the river, but in fact the river was nowhere and everywhere, for he could not decide which of a hundred green lagoons offered the most pleasant and least speedy path to the Gulf (Aldo Leopold, from A Sand County Almanac, describing the Colorado River Delta as it existed in 1922). Today, conditions in the delta have changed. Like other desert river deltas, such as the Nile Delta and the Indus River, the Colorado River delta has been greatly altered by human activity. Decades of dam construction and water diversions in the United States has reduced the delta to a remnant system of small wetlands and brackish mudflats. As reservoirs filled behind dams and captured floodwaters, freshwater flows no longer reached the delta. The construction of Hoover Dam in the 1930s marked the beginning of the modern era for the Colorado River Delta. For six years, as Lake Mead filled behind the dam, virtually no freshwater reached the delta. Even spring flooding was captured. This ecologically devastating event was repeated from 1963 to 1981, as Lake Powell filled behind the Glen Canyon Dam. With these reservoirs now filled, the dams are used to regulate flow so that water can be reliably apportioned among the users of the Colorado River Compact, and its use maximized. Most flood flows can be contained, regulated, and added to the river’s capacity to sustain the Western United States' urban centers and agriculture. Floodwaters are released only when the Bureau of Reclamation, the agency managing the dams, predicts flows that exceed the system’s capacity for use and storage. The loss of freshwater flows to the delta over the twentieth century has reduced delta wetlands to about 5 percent of their original extent, and nonnative species have compromised the ecological health of much of what remains. Stress on ecosystems has allowed invasive plants to out-compete native species along Colorado River riparian areas. Native forests of cottonwood and willow have yielded to sand and mudflats dominated by the nonnative tamarisk (also known as salt cedar), arrowweed, and iodinebush, a transformation that has decreased the habitat value of the riparian forest. The Colorado River basin is home to fourteen native species of fish. Four are endemic and endangered: Colorado pikeminnow (formerly Colorado squawfish), razorback sucker, bonytail chub, and humpback chub. The Upper Colorado River Endangered Fish Recovery Program is a controversial effort by the U.S. Fish and Wildlife Service, in conjunction with the Arizona Game and Fish Department, the Colorado Division Of Wildlife, and the Utah Department Of Wildlife to recover these endangered fish. Moab Tailings is a uranium mill waste pond situated alongside the Colorado River, currently under the control of the U.S. Department of Energy. Locals refer to it as the Moab Tailings Pile. In 1952, Charlie Steen found the largest uranium deposit in the United States near Moab, Utah. The uranium was processed by his Uranium Reduction Company and the waste slurry was stored in an unlined pond adjacent to the river. The Uranium Reduction Company was sold in 1962, and renamed the Atlas Uranium Mill. After the mill was closed in 1984, the pond was capped. It is believed that the waste is leaching into the river, inferred from the lethal effect on fish, primarily from high concentrations of ammonia. In August 2005, the Department of Energy announced that 11.9 million short tons (10.8 million metric tons) of radioactive tailings would be moved, mostly by rail, and buried in a lined hole. The proposed holding site is public land at Crescent Junction, Utah, about 30 miles from the Colorado River. In February 2006, a final Environmental Impact Statement met with United States Environmental Protection Agency approval. The cost of the relocation is estimated to be $300 million dollars. The contract for the first transfer of the tailings has been awarded and the first relocation is expected to occur in late 2008. ↑ Largest Rivers in the United States, USGS; retrieved April 22, 2007. ↑ Summit Daily News, December 23, 2003. Many years ago, the Colorado River was just Grand. Retrieved June 7, 2008. ↑ Robert Lloyd Allen, Jr., The Impact of Tectonic Activity in the Development of Monterey Submarine Canyon, National Technical Information Service. Retrieved June 7, 2008. ↑ Frank Clifford, A trickle of water might save an estuary; Conservationists believe a small but immediate step could renew the Colorado River Delta, Los Angeles Times. Retrieved June 7, 2008. ↑ M.K. Briggs and S. Cornelius, "Opportunities for ecological improvement along the lower Colorado River and delta," Wetlands: the Journal of the Society of the Wetlands Scientists 18(4): 513. Adler, Robert W. 2007. Restoring Colorado River Ecosystems: A Troubled Sense of Immensity. Washington: Island Press. ISBN 9781597260572. Briggs, Mark, Chelsea Congdon, Edward Glenn, Daniel F. Luecke, Jennifer Pitt, and Carlos Valdés-Casillas. June 1999. A Delta Once More: Restoring Riparian and Wetland Habitat in the Colorado River Delta. Environmental Defense Fund. Retrieved June 7, 2008. Colorado River Indian Reservation. Colorado River Indian Tribes. Retrieved June 7, 2008. Lavender, David Sievert. 1982. Colorado River Country. New York: Dutton. ISBN 9780525241515. Powell, John Wesley. 1961. The Exploration of the Colorado River and its Canyons. New York: Dover. Ribokas, Bob. The Colorado River. Grand Canyon Explorer. Retrieved June 7, 2008. This page was last modified on 13 March 2017, at 22:20.